Dikshitar begins charanam by picturesque description of the Ambal Akhilandeshwari Sannidhi in Thiruvanaikkaval. So, in the first line, Dikshitar sings, that Ambal is worshipped (poojite) by Lambhodara and Guruguha. Sri Ganesha idol is kept behind Ambal shrine. Lambhodara is split as Lamba + Udhara - Big Tummy. Lord Ganesha is supposed to be extremlely cute and adorable and has a big tummy of an elephant. Who is not enchanted by a small cute elephant prancing around? No wonder Mother Ambal lost her Ugram after this! Also, there is a sannidhi (installation) of Sri Murugan behind the shrine of Ambal too. Murugan is denoted by Guruguha -> Guru + Guha - The Secret Master! or The Master who resides in the deeply in the caves (guha) of our heart. Guruguha is also the 'mudra' or signature of Sri Mutthuswamy Dikshitar. He signs all his songs with this name and the name of the Raga in which the song is set. Bestower of boons (Vara)! Sri Akhilandeshwari is the ultimate bestower of boons! I want to describe an incident here - One of my closest friend's elder sister, when she was 3 years old, took a few camphor tablets by mistake! It was quite poisonous. Her parents rushed her to a famous Iyer doctor near Thiruvanaikkaval (since it was close to Srirangam, my friend's hometown) - The doctor on seeing the condition of my friend's sister gave up, and said 'If anyone can save her, it is Sri Akhilandeshwari only!' - My friends parents rushed to the Shrine and placed the unconscious kid in front of the Shrine and prayed. And, miraculously, the girl woke up in a few minutes without any problem! (She is a proud mother of two wonderful kids now). I don't believe in false aggrandization and hype - I have only stated what I know is true. Ambal, as Parvati took form as the daughter of the Himalayan Mountains (Parvatan) - Dikshitar seems to indicate this part of Shiva Puranam. Sharada is a famous name ascribed to Sri Saraswati and also Ambal. Sri Maha Vishnu (Janardhana) also extolls Her. Dikshitar thus ends the song on Ambal. So, if you go to Trichy, please don't miss this wonderful temple! It will be interesting to see that the deepam(lamp) close to Ambal's face would be wavering, while the one near the feet is stable. The wavering is supposed to be indicate that Ambal Akhilandenshwari is indeed alive, and actually breathing! When I went to attend Trichy to attend marriage of cousin (whose name is same of that of the Ambal), I decided to visit the temple early in the morning, about 5:30 am. The Shrine was just opened, and when I stood there, the poojari (gurukkal) suddenly left the shrine, and there were absolutely no one in the temple. 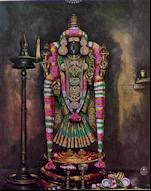 I could clearly see Ambal in all glory, wearing the Thaadakam, an in reflection of the oil lamp. I intuitively started singing this song! And the gurukkal did not come till I finished the song! It was an intimate affair between Ambal and me. I'll never forget that transformative experience. Today, while returning home from office, late in the night, I started humming the song ‘Akhilandeshwari’ – a total turnaround from my humming of ‘Nenjukkul Peithidum’ from Vaaranam Aayiram a day earlier! The very name ‘Akhilandeshwari’ transports me to my college days in Regional Engineering College, Trichy. I used to make frequent trips to Sri Jambukeswarar – Akhilandeshwari temple in Thiruvanaikkaval, Trichy (below). I usually combined such trips with Sri Ranganthaswamy Temple – Srirangam, Uchhi Pillayar Temple (Rock Fort)and Thaayumanavar Sannidhi. I have fond memories of me and my friend (Ramkumar) spending Shivaratri chanting ‘ekadasi’ Rudram / Chamakam for Sri Jambukeswarar through the night. The Thiruvanaikkaval temple is one of the ‘Pancha Bhootha Sthalam’s of Lord Shiva. The term ‘Pancha Bootham’ is often used to denote ‘Five Basic Elements’ from which the entire matter is made up of. (According to Vedic and Siddha literature) – The five elements are Space, Air, Fire, Water and Earth. Sri Jambukeswarar is the aspect of Shiva denoting water. The Shiva Lingam there is always surrounded by water, even during adverse drought conditions. Sri Akhilandeshwari is the consort of Sri Jambukeswarar. Sri Muthuswamy Dikshitar has composed a wonderful song on this Ambal (a name popularly used to fondly denote Shiva’s consort). This was the song I was humming. For a soulful rendition of this song by M.S. Subbulakshmi, please click here. I wanted to share the meaning of the song, so people can enhance their enjoyment of this wonderful song. The word Akhilam means ‘All’. Andam means Egg. This usually denotes the egg in the Golden Womb (Hiranya (Gold) Garbham (womb)) of Ambal which gave birth to the entire Universe. Ishwari means absolute Controller. Dikshitar addresses Ambal by her name which means that She is the Mother of the entire Creation and asks for Her Divine Protection! Dikshitar describes Ambal is the absolute expert in Scriptures and Traditions. Nikhila – (like ‘Akhila’ in pallavi) ‘All’. Nitya (always) Atmike (soul) – this is a beautiful expression from Dikshitar. He describes Ambal as the eternal soul of the entire creation. Ambal pervades the entire creation. The meaning is identical to the above term. Except that the author uses ‘nir’ to negate impurity (mala). Dikshitar seems to have been overwhelmed by the Pure nature of Ambal. Shyamale – Dark in complexion! Here comes the Genius of Dikshitar! We cannot split this word like the two above J- This term simply means that Ambal is dark in complexion! Ambal as the Mother, Knows all Arts - It also exemplifies the aspect of Ambal that is related to fine arts. The post has become quite long already! I'll work on the Charanam tomorrow! I definitely did not want my first blog entry of the year with this title. But, I was pondering over the nature of losers. (1) Losers have mere dreams - But, these are not goals. Dreams become goals only when one tries to achieve it. When dreams remain wishes, they do not become goals. For e.g., one may want an Audi R8. But, what steps are taken to achieve that goal? If none are taken, then the object of desire remains in the domain of dreams and not goals. More dreams, less goals => loser. (2) Underpowered - Losers achieve when the fruits are (proverbially) low hanging. Any one can pick them up. What makes it disgusting is that they even celebrate it. They do not have power to sustain intensity for a decent amount of time. They just run out of power. (3) Under-willed - Great things are achieved mostly by perseverence than by brilliance. Achieving great things requires one to go on and on and on (pointed by the ad of Duracell). Losers simply lack the will to persevere. They may be able to achieve stuff that may need intensity but not those that require perseverence. They simply give up too easily. (4) Find Excuses - This is a masterpiece work of losers. I find that this reason alone should be sufficient to identify a loser. This work of art requires shifting the blame to a third party (non-self). 'I lost because of .......' (feel free to fill up the blanks with most imaginative sentences). They even superficially believe that! Mind is indeed strange. (5) Procrastinate - Paul Graham wrote a lovely piece of work on procrastination. It is difficult for losers to be idle. So, they choose to engage themselves thoroughly with trivial or unimportant work. This way they even get a wonderful excuse of 'not finding enough time' - Tom Peters used to say 'You make time if you care'. How true! I truly shudder when I think that I derived all the five attributes listed above looking at no one but me. People are usually surprised when I say that. I am supposed to be a successful person. The sad part is that I used to believe that. I have faced losses that are truly irrevocable. But there are always opportunities to redeem in some cases. Confucius (and few other great people) have told that greatness lies not in not falling at all, but rising every time one falls. I atleast have decided to stand up again, this time.